When you snap a picture, the Samsung Galaxy Tab can save your location. This information is obtained from the Tab’s GPS, the same tool used to find your location on a map. 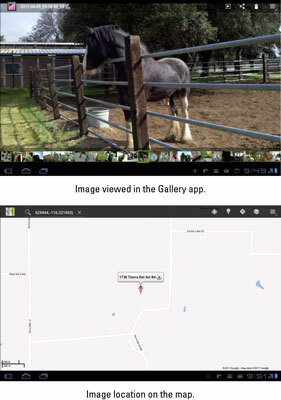 In fact, you can use the GPS information saved with a picture to see exactly where the picture was taken. Choose the command Show On Map. The Maps app starts, showing the approximate location where the picture was taken. Not every image has location information. In some cases, the Galaxy Tab cannot read the GPS to store the information. When this happens, location information is unavailable and the Show On Map command doesn’t show up on the menu. Videos also store location information on the Galaxy Tab, though there doesn’t appear to be any way to access that information by using the Gallery app. The Tab’s GPS can be disabled for images you capture.